The Social Security Board of Trustees today released its annual report on the long-term financial status of the Social Security Trust Funds. The combined asset reserves of the Old-Age and Survivors Insurance and Disability Insurance (OASI and DI) Trust Funds are projected to become depleted in 2035, one year later than projected last year, with 80 percent of benefits payable at that time. View the 2019 Trustees Report at www.socialsecurity.gov/OACT/TR/2019/. The change in the estimate for the Disability Trust Fund must be the most massive correction every made by the Chief Actuary in Social Security's long history. That correction tells me that the Disability Trust Fund projection is nearly meaningless. The Chief Actuary doesn't know what's going on. Nobody does. By the way, back when the Disability Trust Fund balance was going down, I kept saying that it was coming closer and closer to being in balance, that it might survive even without a legislative fix. We had a legislative fix to temporarily shunt more money into the Disability Trust Fund but I still wonder whether that was necessary. Would the Disability Trust Fund have ever run out of money if nothing had been done? In case the verbiage confuses you, the result is clear. BOND costs more than it saves. Social Security paid out more in benefits without inducing additional claimants to return to work or at least not enough of them to outweigh the additional benefits. BOND, just like all other efforts to induce Social Security disability recipients to return to work, is a failure. I think I understand why Social Security wasn't trumpeting this report. I wish we had a good study on how the "gig economy", that is people who work in various sorts of non-traditional employment such as temp work, being an Uber driver, etc., affects Social Security disability. Some researchers associated with the Center for Retirement Research at Boston College have a report out on the subject. Unfortunately, it doesn't answer any questions that seem important to me but, at least, it's a start. Maybe these researchers or others will keep working on it. I'd really like to know whether the existence of the gig economy helps people avoid filing disability claims. Maybe they can't sustain regular, full time employment but maybe they can sustain intermittent employment, so long as they can choose when they work. If it does, is this truly a good thing? Gig employment, from what I've seen, mostly leads to impoverishment. It just takes a bit longer to get there than if you're fully unemployed. One of my firm’s legal assistants e-mailed me yesterday afternoon with a question. She had been on the phone with a Social Security employee inquiring about a delay in benefit payment to a client. She had been told that it was a “national stagger walk case.” She wanted to know what that was. It took me a few minutes but I eventually figured out that she must have misunderstood what had been said, that the Social Security employee must have been referring to the Steigerwald v. Berryhill class action on computation of SSI back benefits when the claimant had been represented and there was also a Disability Insurance Benefits claim. I think I need to get out some information about Steigerwald to the legal assistants at my firm. This raises the question: What is going on now with Steigerwald at Social Security? Have they conceded that they’ll have to make the recomputations? How do they plan to do it? How much disruption will this cause? Why Wasn't There Anyone At This Town Hall To Challenge Him? Tom Reed is the Ranking Republican member on the House Social Security Subcommittee. He recently held a town hall meeting on Social Security in his district. The Olean Times Herald report on the town hall says that Reed was asked about the impending shortfall in the Social Security trust funds. Reed answered that "We need to make sure we keep the economy humming and get people working.” That means he doesn't want increased taxes which means the only way to deal with the shortfall that is acceptable to him is to cut Social Security benefits, although Reed certainly didn't say this. Congressional Republicans carefully avoid saying that. They always imply it's some sort of puzzle that someone needs to figure out, as if there's some way of dealing with the shortfall that doesn't involve cutting benefits or raising taxes, which is nonsense. Apparently, no one at the meeting challenged Reed on this. Why Are There Fewer Social Security Disability Claims Now? There has been a 32% decline in the number of disability claims received by the Social Security Administration between the peak year of 2010 and 2018. See the chart below. There must be some explanation for this dramatic change. I'm going to explore what might be behind this. The most commonly given explanation is the reduction in unemployment between 2010 and 2018, which is shown on the chart below. It just makes sense that disabled people would have a harder time holding down a job in a time of high unemployment. The theory that the answer is unemployment appeals to many on the right because it allows them to claim that disability benefits are thinly disguised unemployment benefits. In their view, many of those drawing disability benefits aren't really disabled; they just can't find jobs. Of course, they don't want to give them unemployment benefits either but that's another story. This theory never made sense to me as an explanation for the earlier increase in the number of disability claims. It wasn't what I was seeing on the ground. I did see a few disabled people who had been struggling to hold down a job who became the first to be laid off during the great recession but not many. Don't rely upon my anecdotal account of what was going on during the great recession, though. The big problem with the unemployment theory is that while the unemployment rate went down dramatically between 2010 and 2016, the reduction started flattening out in 2017 and there was little or no reduction in 2018 and so far in 2019 yet the number of disability claims filed has continued its steep decline in 2018 and early 2019. Why would that be if unemployment is the answer? While it's certainly possible that the reduction in unemployment was a factor in the decline in the number of disability claims, it certainly cannot be the only factor at work. One possible explanation that has occurred to me is that fewer people regard themselves as disabled than was the case a few years ago. Maybe it's medical advances. Maybe it's more people able to get medical care as a result of the Affordable Care Act. The chart below suggests otherwise. 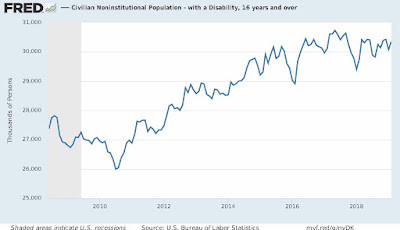 The number of people who described themselves as disabled went up between 2010 and 2016 as the rate of unemployment went down and has stabilized since. That doesn't match up at all with the number of disability claims. The unemployment rate is only the percent of those who are looking for work who can't find work. People who are neither working nor looking for work don't show up in the unemployment rate. Maybe the improving economy drew more people into the workforce and away from disability claims. However, the chart below suggests that didn't happen at all. 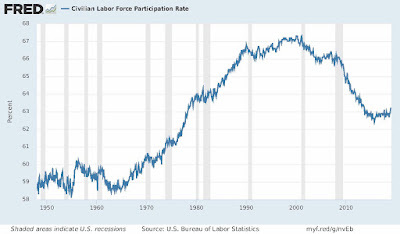 The labor force participation rate actually went down as the rate of unemployment went down. That's the opposite of what you would expect if more disabled people were working instead of filing disability claims. If anything, this data undermines the theory that there's a strong link between unemployment and disability claims. 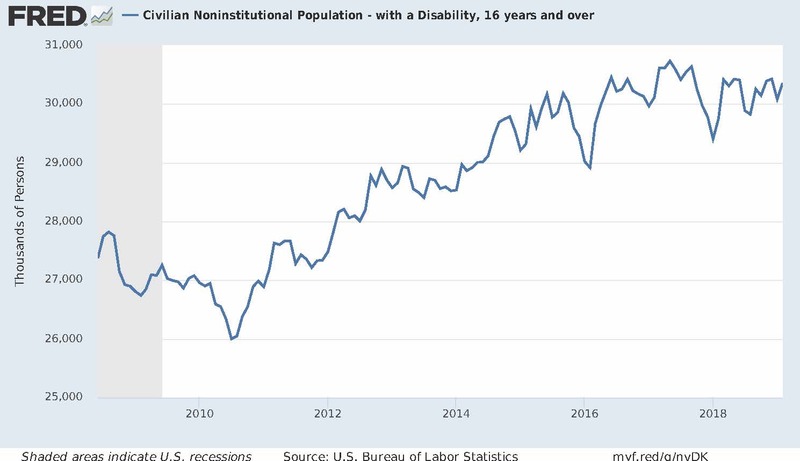 I've wondered whether the disabled population was participating in the labor force at a greater rate even if the rest of the population isn't but that isn't the case. 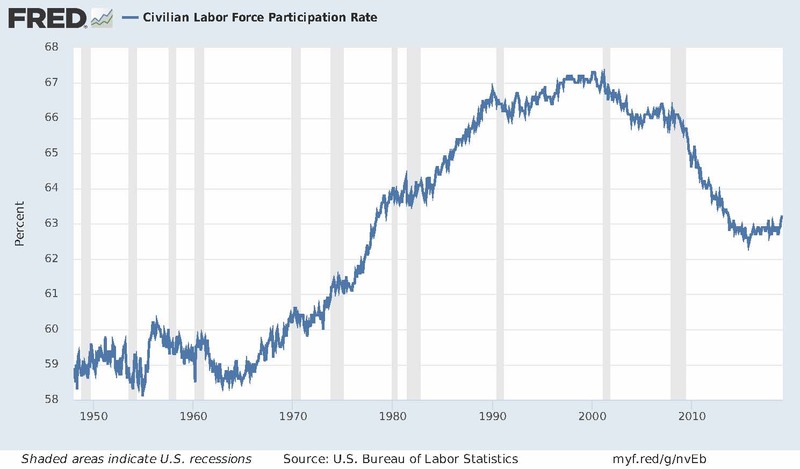 I don't have a chart for it but in June 2010 21.7% of persons with a disability age 16 and over were participating in the civilian labor force while in 2018 20.8% were participating. That's a minor reduction, not an increase. Again, if anything, this data undermines the theory that unemployment and disability claims are closely linked. The incidence of disability goes up sharply as people age as shown on the chart below from the Urban Institute. Age 50 is an important break point around which the incidence of disability starts going up significantly. During the Great Depression and World War II the birth rate in the United States was quite low but that changed dramatically after World War II. However, the number of births didn't eventually just level off. They actually started going down in 1962 and didn't start picking up again until 1979. See the chart below. Fifty years after the decline in births was 2012. That's about when the number of Social Security disability claims started going down. Also, by that time, the oldest of the baby boom generation had aged out of Social Security disability because they had hit full retirement age. Maybe there were just fewer people in the most disability prone age group. There's reason to believe that this demographic change has something to do with the decline in Social Security disability claims. However, demographics can't fully explain the rapid rise then 32% fall in the number of disability claims. The change in the birth rate in the 1960s wasn't anywhere near that dramatic. Could Some Of It Be Discouragement? I don't have any charts or data to support or undermine this theory but I wonder if some of the change is discouragement -- claimants who delay filing disability claims either because they feel they won't be approved or because they find the process of filing a claim to be too daunting. People who stop work on account of illness or injury don't just rush in to file disability claims right away or, at least, few do so. There's usually a gap of at least a few months before they file a claim. It's not unusual for the gap to be years. Does the median gap between onset of disability and the date of filing a Social Security disability claim change over time? Those who are considering filing a disability claim often ask "Do I have a chance?" I think people ask the question because they're afraid of being crushed by a denial. My theory is the general fear of denial is affected by the political zeitgeist. If I'm right, people thought that the chances of success with a Social Security disability claim went down after the 2010 election put Republicans in control of the House of Representatives who started pressuring Social Security to deny more claims. I know that before that election I often heard clients say things like "If Social Security approved that lazy guy down the street, why haven't they approved me?" I don't hear that sort of thing so much today. I think it's because people now perceive that it's more difficult to be approved. That's true to some extent but not enough that people should be discouraged about filing a claim. Sitting around doing nothing as one's financial situation crumbles is a bad idea but most disabled people have very mixed emotions about filing a disability claim. It doesn't take much to cause many of them to delay filing a claim based upon a vain hope that their medical condition will improve. People may also be discouraged by the increased difficulty in actually filing Social Security disability claims. It became much harder to get through to the agency on the telephone after the 2010 election. The agency's budget suffered. Wait times on the 800 line and at the field offices soared. Yes, it's possible to file some disability claims online but it's a lot harder than filing a retirement claim and you can't file an SSI claim online. On the whole, I'm pretty sure that disability claimants have a harder time filing any kind of claim online than retirement claimants. Disability claimants have, on average, less education, fewer computer skills and greater psychiatric difficulties interfering with their ability to use online resources. Disabled people usually have very mixed emotions about filing disability claims. It doesn't take much to discourage them because they keep hoping they'll get better. I would like to see numbers on how the median difference between alleged onset date and claim date has changed over the years. I suspect the gap went up substantially after 2010. Perhaps the data would support my theory. Perhaps not. I wish I had a good explanation for what has happened and what is happening. If anything, I may have somewhat knocked down the theory that it's the unemployment rate without being able to substitute an alternative theory that fully explains what has happened. I'd be interested in the theories that others have. Please give data to support your theories. How Is A Disabled Person Supposed To Look? More Disability Recipients Returning To Work?